Tumbled Bluestone walkway and patio stone is a unique stone choice for patios, walkways, spa decks, etc.. The tumbled edges which have been softened by a mechanical tumbler instantly provide a classic aged look. A variety of sizes fit together nicely into unique patterns. The color is blue-gray and the top surface has a smooth but not slippery finish. Tumbled Bluestone walkway and patio stone offers a different way to bring Bluestone into a walkway, patio, spa, and outdoor kitchen area. Tumbled Bluestone walkway and patio stone is another example of the unique Landscape Stone we carry at Wicki Stone. Tumbled Bluestone walkway and patio stone. A unique variation on the bluestone walkway and patio theme with softened edges achieved through the tumbling process. Primarily blue-gray with accents of brown, tan, rust, and sometimes green. Slightly textured surface that is not slippery. Pieces are cut to exact dimensions before tumbling so coverage is dependent on how much you buy. 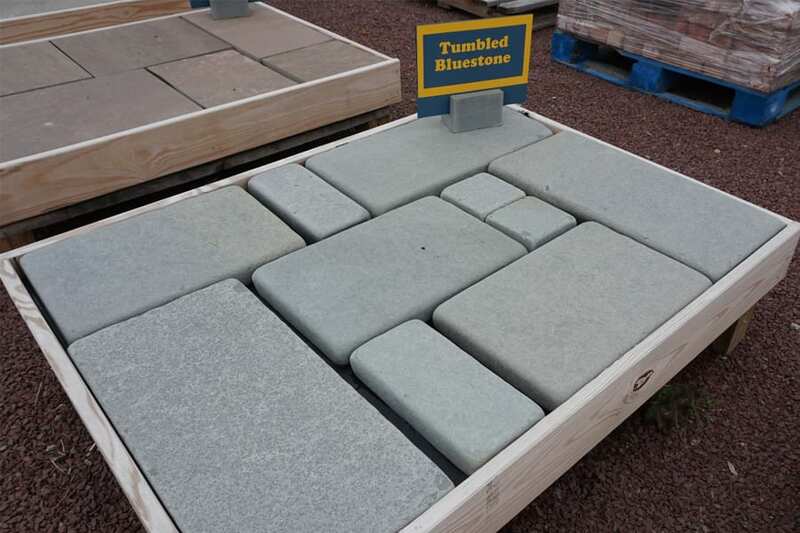 A typical pallet of 1.5" tumbled bluestone will cover an average of 180 square feet. By the pallet. Extremely limited single pieces may be available in an open pallet in the yard, but we strongly prefer to sell this stone by the pallet. 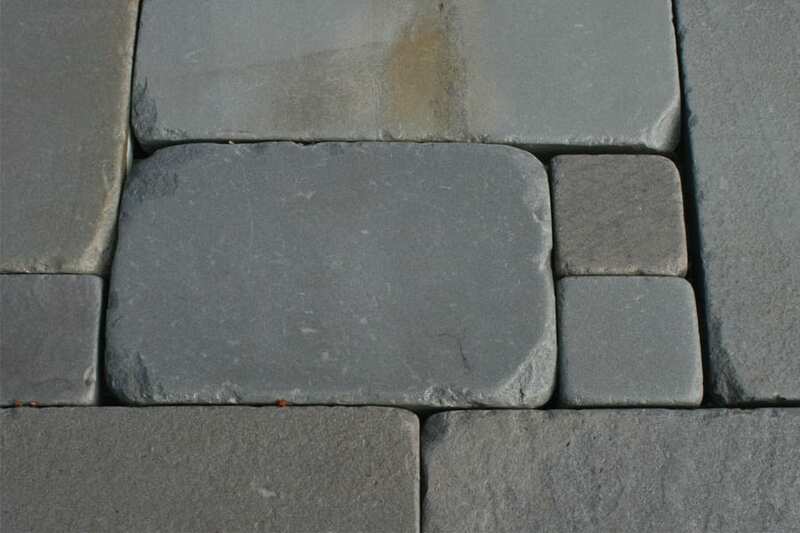 A unique variation on bluestone for the walkway or patio. Tumbled Bluestone walkway and patio stone features precisely cut bluestone squares and rectangles of varying sizes that are tumbled in a hopper with an abrasive filler. The results is jagged and smooth edges that instantly give an aged, antiqued look to the stone. The variable colors of full range color brings in subtle earth tones to the blue-gray color of bluestone so there is a unique color element as well. This is easy stone to work with. Tumbled Bluestone instantly adds a sense of age, and history to the installation. We strongly prefer that you buy a whole pallet, however there is typically an open pallet in the yard and you can pick individual pieces from that pallet. We do not allow customers to open new pallets and then mix and match pieces (for size or color) from more than one open pallet. Why do you call it full range color? There are 2 basic bluestone colors - Blue-Blue and Full Range (sometimes call Off Color). Blue-blue includes only the bluish-silver tones of bluestone, where Full Range Color (Off-Color) brings in earth tones like brown, rust, tan, even green.